I just realized, I never posted pictures of my finished projects for May and June TIF. 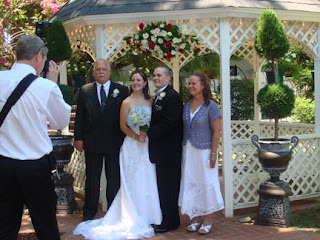 I am trying to get caught up after the excitement and preparation of the wedding this past Sunday. Last week, I gave away the project I had finished for TIF May, an eyeglass case as a play it forward gift on my blog. but I decided the June colors were more of my sisters colors, so I gave this one away. This was the TIF color scheme for June, and this I also made up into an eyeglass case. My sister loved this when I gave it to her for her birthday this past weekend. I still have July's to stitch, and August's colors to put together. after the wedding which she let me copy. But the images were set at 50" and I needed to scale them down, which I finally got a chance to do this morning. 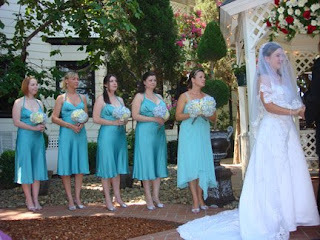 Katie's sister Kristen is the maid of honor and standing behind her. We were getting photos taken by the photographer and by families at the same time. DH John doesn't usually smile for any photos. He is looking good in a suit he hasn't been about to wear for awhile. 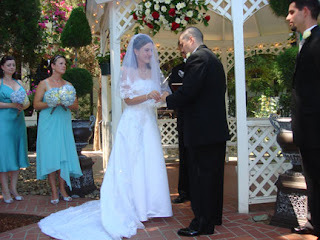 He lost around 18 pounds, and I had lost 27 before the wedding. This is Kristen's youngest, Keaton, who will be 2 in October. When the music started, he was out dancing every dance, especially the fast ones. 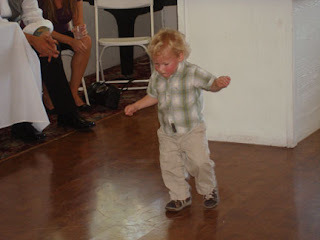 Keaton and older brother Jaeger were both out on the floor dancing with Kristen to La Bamba, it was the cutest thing. Jaeger has all the fancy foot movements, like Papa John used to be able to do. But Keaton consistently was dancing every dance. I can't wait to see what kind of photos the photographer has. Sorry I have been away so much recently. Our youngest daughter was married yesterday. Had been concentrating on getting the yard, house and food ready for that celebration. The wedding was held in Victorian house in the older part of town, and went off pretty well. It was held in the gazebo. DH told me that DD went through a box of Kleenex before he brought her down theaisle. The bridesmaids came out, and I looked at matron of honor, DD1 and she had tears in her eyes, and I got teary, with no Kleenex. I was able to lose 27 pounds before the wedding and got a wonderful dress. It was a great day, and a great weekend visiting with family and friends. The last of the company went home yesterday, so DH and I have the house back to ourselves. Hope to get stitching this afternoon after work. I plan to take my stack of beads, theads and everything else where it usually resides by my comfy chair and get stitching again. Also have some sewing to do in my sewing room for granddaughter Kyleigh's BD on Sunday. She wanted me to embroider some motifs on a couple of more hooded sweatshirts. I also plan to make her a dress or maybe 2. Candace is celebrating her 100th post with a giveaway. Lise is celebrating her 100th post giveaway. Cheryl at Polkadots & Ric Rac is also having a giveaway celebrating her 1 year blog anniversary. I have tried contacting you 2 times through both addresses you have given me, and gotten no response. Your comments come right to me no problem, so I know the e-mail address on my blog is OK. Everyone else has gotten through that link with no problem. I even tried contacting you through your second e-mail address with my alternate e-mail address and no response with that one either. I really don't know what else I can do. I have checked to see if you have been filtered out as spam in my e-mail program, and that is not happening either. I have been very, very, very busy this week. DDs wedding is 8 days from today. I have done nothing at all stitchy in any way. Been cleaning, and weeding, and everything else. I bought shoes, and a dress. But wanted to announce the winner of my eyeglass case and it is Debbie in Maine! Congratulations Debbie. I will get that off to you this week.